Looking to shed the weight created by operational overwhelm in order to scale your business? 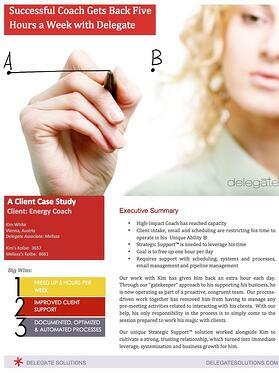 See how Delegate used a unique methodology to leverage a Coach's time to create greater focus on his transformational client sessions! Download this FREE case study to explore how we relieved our client of email, systems and scheduling overwhelm through systemization in order to help him gain back 5 hours per week.